This is number 7 in Klompmakers' book on this series. It is also used on the front of the dust jacket. Shuki is the owner of an inn near the headquarters of the band of brigands. He acts as a spy on their front lines. When he knows of a particularly vulnerable rich merchant he sends a special arrow in the direction of his cohorts' camp and they come and rob the man. When he or the group are threatened he also send one of his noise-producing arrows and the group jump into action. "At times brutal, Shuki is known to murder travellers himself and sell their flesh as meat and their fat as lamp fuel. 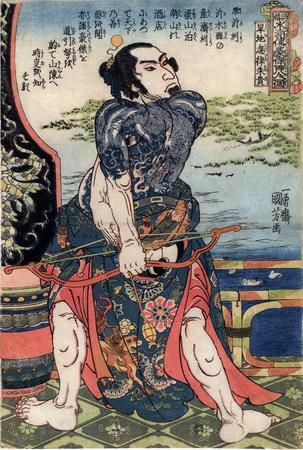 [Later he] becomes one of the captains of the Ryōsanpaku gang..." Source and quote from: Of Brigands and Bravery: Kuniyoshi's Heroes of the Suikoden, p. 54. "You are one of them and I didn't know," Lin [Chong] exclaimed. "I 'had eyes and didn't recognize Mount Taishan!' Please tell me your name." He bowed politely. The man returned the bow. "This humble person is the lookout for Chieftain Wong. I am called Zhu Gui. I come originally from Yishui County in Yizhou Prefecture. Among the fraternity I'm known as the Dry-Land Crocodile. In the guise of running this wine shop my jobis to observe the movements of merchants and travellers. I let the stronghold know if they are carrying anything of value. When you asked about Liangshan Marsh I thought I'd better find out more about you. Then you wrote your name on the wall, and I remembered people from the capital telling of your gallantry. I never thought we'd meet here today. Since lord Chai has written an introduction, Chieftain Wang is sure to welcome a man of your splendid reputation." Zhu Gui feasted Lin with a meal of fish and meat and wine and delicacies. They ate and drank in the waterside room till half the night was gone." 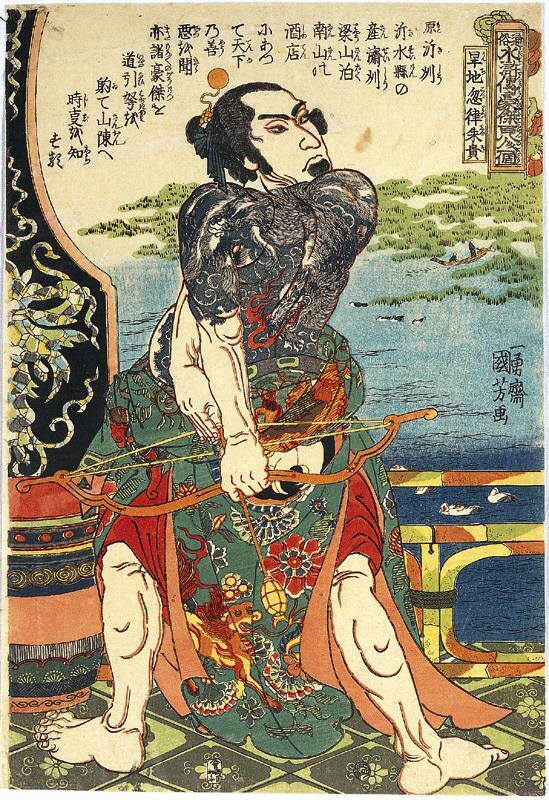 There are other copies of this print in the Ota Memorial Museum of Art and the Ishibi Prefectural Museum. We know that this print was published over time by two different publishers. One was Kagaya Kichiebei and the other Ibaya Senzaburō. We have compared the prints produced by both houses and feel that on looks alone the one by Kagaya Kichibei is the earlier of the two. This is confirmed by the fact that the example in the British Museum, published by Ibaya Senzaburō, shows a seal only used in 1847, according to Andreas Marks.